This goes under my ‘best presents are book shaped’ posts as my wife really does buy the best presents and, more often than not, they are book shaped. 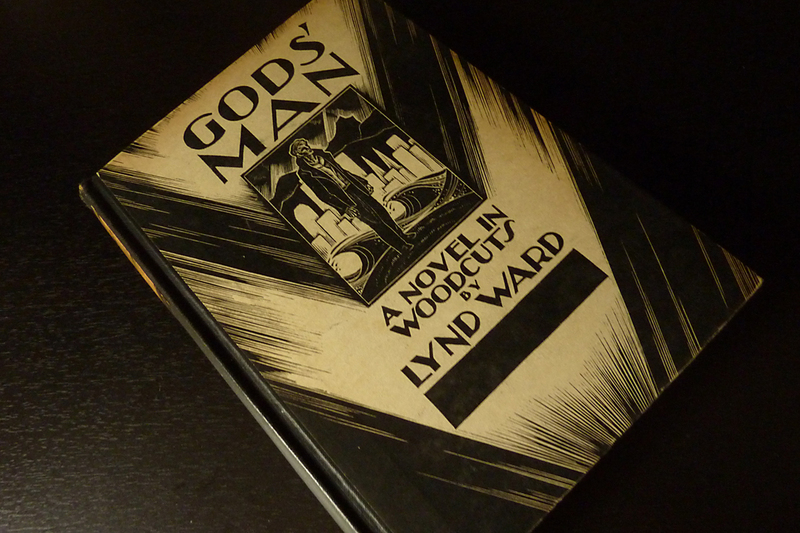 I’m happy to display my ignorance here, I was only vaguely aware of the name Lynd Ward; one of those names that hover around in the edgelands of your consciousness, one of those names that you’ve read somewhere but you’re not sure what it’s connected with. Yes, I was ignorant of Lynd Ward’s work and glad of it because it’s wonderful when, in the middle of middle-agedness, you can still find things to surprise, delight and excite you. Along with my passion for books, particularly mid-20th century horror books, I also have an interest in early 20th century German Expressionist woodcuts (of which I own a small collection). Not surprising really, I suppose, as the Expressionist movement had such a massive influence on the development of the horror genre through the 20th century. So, imagine how thrilled I was to unwrap this beautiful 1st edition / 4th printing. That gorgeous cover design, comfortably straddling the fine line between Expressionist and Deco. That enigmatically placed apostrophe. And that subtitle . . . ‘A Novel in Woodcuts’! A Novel in Woodcuts – for those of you who are, as I was a few weeks back, unaware of this book, it is just that. There are no words other than the title and chapter headings, the story is purely, and very lucidly, driven by Ward’s prints. As such, it is considered to be the first American graphic novel (Ward was very much influenced by the slightly earlier works of the German, Otto Nückel and the Belgian, Frans Masereel, both of whom produced wordless woodcut novels). The story itself is a Faustian tale concerning a down at heels artist who signs a contract with a sinister masked figure in return for a mysterious paintbrush which will guarantee him fame and fortune. We follow the artist’s misadventures through a magnificently decadent high-rise deco cityscape, where his new life of success spins wildly out of control. This harsh, rectilineal world is contrasted with the gentle curves of the pastoral landscape he finds happiness in during the latter part of the novel. It’s very much a tale of duality, hence that apostrophe in the title. This was Ward’s first novel and proved an instant success, despite the unfortunate timing of the launch coinciding with the Great Stockmarket Crash of 1929, and he went on to produce five more Novels in Woodcuts over the following few years. Perhaps I will need to drop a few hints to my wife for my birthday next year. Fantastic! Did Ward illustrate a version of Frankenstein? He did indeed, Graham! He became quite a prolific illustrator on the back of his first novel. I must find a copy of his Frankenstein. And his take on Beowulf too!! Ward is one of my favourite artists – making wordless graphic novels long before anyone else even thought of it. I have a lovely box set of two volumes in a slipcase containing all six of his novels published by the Library of America. A prized possession. Also, if you look up Ward on Wikipedia there is a hi-res scan of one of the actual woodblocks – absolutely incredible! Yes! I saw that scan of Ward’s woodblock, amazing. I must get hold of some more of his work. Thankyou, Robert. Ward’s work is wonderful, I can highly recommend seeking some out if you haven’t already. I’m really enjoying your own blog too, keep ’em coming! I’ll look into Ward for sure. And thank you, I’ll be posting more soon! Cheers.